Baja California Travel - Gray Whales - Eschrichtius Robustus, Baja California - Mexico. A well known tourist attraction because of the friendly gray whales. Baja California Travel is on the increase as more whale loving tourists seek their encounters with these beautiful sea creatures. Laguna San Ignacio has been recognized for its importance in birthing and raising young gray whales, and is a protected bioreserve under Mexican law. However Baja California travel is still encouraged with eco-friendly tours being conducted. 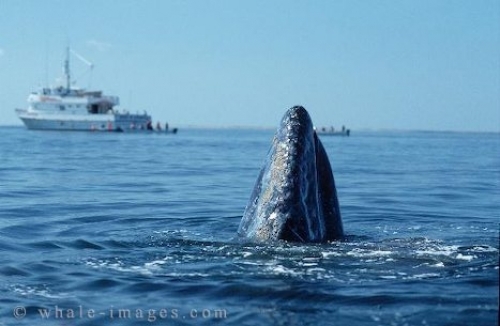 Picture of a small cruise ship and a Gray Whale off the Baja California coast in Mexico.